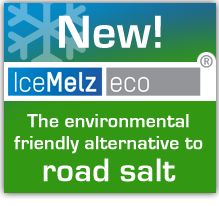 Use therefor IceMelz eco on your parking and entrance to combat slipperiness or sprinkle preventive to avoid slipperiness. And with clean shoes and clean flooring, both your guests and you will enjoy much more the winter festivities. Can you imagine your hotel and/or restaurant in a beautiful winter setting, nicely decorated and lit, something to be proud of. But then, that messy snow and ice on your parking and entrance are a real game-breaker. If you would use road salts to combat the snow and ice, your guests will come from your parking through your entrance getting the horrible mix of snow, water and salt on their festive new shoes leaving stains that can not be cleaned. And, your guest will carry the corrosive mix of snow, water and salt in to your establishment damaging your expensive wooden floors and or carpets. Both guests and you as proud owner will not be happy! That’s why: use IceMelz eco during the winter months to avoid and/or prevent slipperiness around your beautiful restaurant and/or hotel!